I've neglected this site for a bit, I was upset as a result of a Forgery felony whereas I (and many others) was a victim, as a result, it happens that my Canvas collection was forged by a Peter Max official store owner. The case was investigated by the FBI Art department, the culprit found guilty and now is spending some time behind bars along with 2 accomplices. I am waiting for some retribution, but not overly excited of obtaining it since the perpetrator allegedly has also more raps with the law. 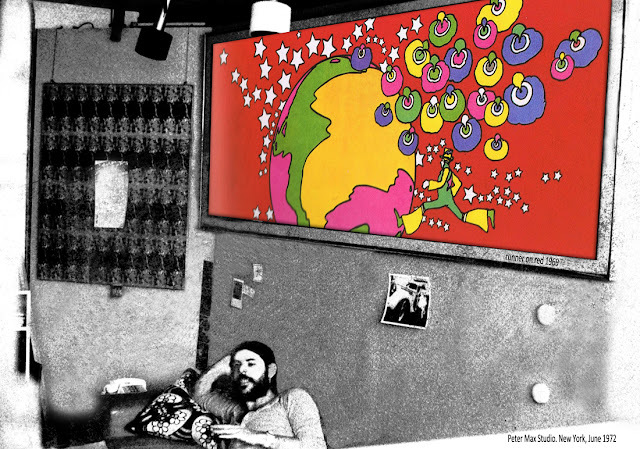 Unfortunately, the PETER MAX studio was not highly cooperative with me, and I spent a fortune in attorney's fees to obtain some positive results, even if only moral. Still, I admire the old PETER MAX, the great Pop Artist of the Sixties and Seventies, and the one that created American images that will remain for years to come. 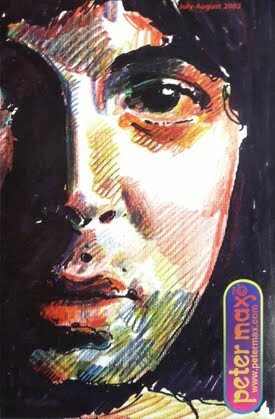 But for me, whatever emanates from the studio after 2010, is not as valuable or important as all the other pieces his studio and himself participated, even the Lithograph, serigraphs, licensed items and signed poster are more valuable because they have the true spirit of the man not only the Dollar Sign. 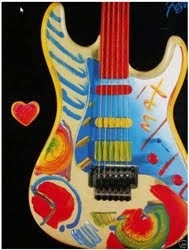 Having said that, I believe The Max Collector has the biggest and most varied collection of collectibles and Memorabilia of Peter and I will care for it, increase it and leave it as a family legacy so that my grand-children will be able to open a PETER MAX unique pieces museum. After all, regardless of what the Studio is doing now for profit, he is one (along with Robert Indiana) of the few living Pop Artist of that golden era of Americana. 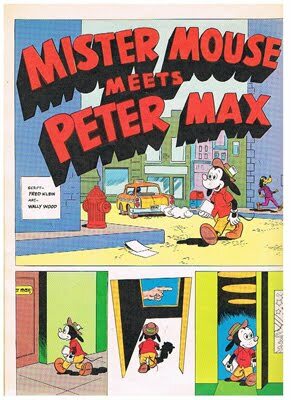 June 1972, I was 22 years old and visiting New York, Mr. Max was already pretty famous, especially after his LOVE and COSMIC RUNNER collections and thousand of fantastic posters that decorated more than one home and office wall. 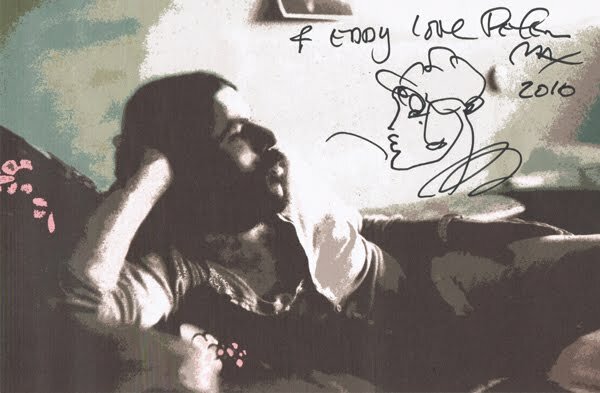 I was a pseudo-hippie who admired his work and even tried to copy his ideas in my aficionado drawings, so I decided that I had to meet him, not an easy task for a youngster from Italy living in South America. I moved some contacts in the magazine industry in my home city, and voila!, I got the assignment as the graphic reporter for a low budget magazine (I was an amateur Photographer by then). I took all my money savings and planned a trip to New York with a close friend. Once there, I made some phone calls, which were promptly replied and to my surprise and rejoice, next day after my arrival to the Big Apple, I found myself in his downtown NY three floors studio, sitting down in his private office and chit-chatting with him about I cannot remember what, but surely related to some cosmic world or the beauty of Karmic aura. He was lying down comfortably under the protection of a RUNNER IN RED. 35 years of age on October 1972, and yet his spirit was the quintessence of that revolutionary era that changed the world, he was so very cool and spiritual that I was marked by this for a long time. I had my Nikon F2 with the mandatory 105mm portrait lens and a pushed 800 ASA Kodak film for larger grain, but now in retrospective, I wish I had an Ektachrome slide film roll on it, so I took some images, that I finally found after 38 long years. Funny thing? I never made this interview nor the images known until 2011. (RUNNER IN RED done in 1969. The image I took was in black and white, I copy-pasted it in color for a dramatic effect). For those who do not believe in destiny... here comes the good part of this story: I am having my usual morning coffee reading the Miami Herald, and to my surprise I read some kind of info-ad mentioning that Mr. Max would be present at a Meet and Greet event in a Coconut Grove Gallery, so I decided it was only fair that I let Peter have copies of the old New York visit images as a gift. I have no doubt that he is the last of the relevant POP artists around and he will be for a while since he has a healthy life and a peaceful attitude, so it would be a great honor for me to deliver my prints. I even intervened one of them with PS, and I added some very spiffy toned down colors. May 15th, 2010 Location: MAX AT THE GROVE, south Miami, time: 8:00 P.M. My wife and I arrive at the meet the artist presentation of PM, and the tiny space was filled with his art, most of his work were represented there in one way or another, be it canvas, mixed media and acrylic, lithographs, or simple prints along with some objects such as a Mexican Fender Guitar, a 1994 World Cup soccer statuette, and Football helmets. It was quite crowded yet comfortable to roam around detailing the art pieces. Peter was sitting next to a table talking with other gentlemen, but I managed to catch his attention and had the chance to have a brief conversation and hand him the New York images. He was startled, immediately passing them around to all his business associates and nearby friends, then very humbly asked me "Are these for me?". I was amazed, perhaps waiting some arrogant and detached remark, but I was pleased by giving him the two somewhat destroyed pictures, almost sure that his work force had many experts in retouching them, plus I included some additional personally reconstructed sets I made for him. He was so very gracious, gave me his personal card and told his assistant to remind him to have a souvenir sent to me to Miami. I had the audacity of asking him to sign one of the copies of the pictures I took, and he very graciously accepted. What a souvenir for my collection! Oh, I cannot forget to add that we bought a huge 48 x 48 ins." 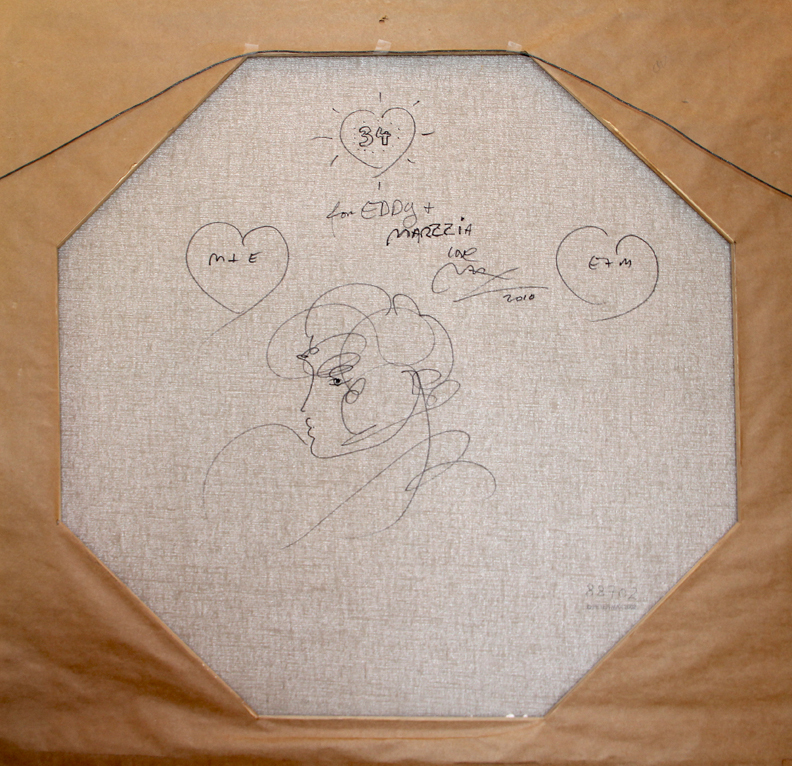 Liberty Head" original canvas that night, and he scribbled it with marker behind on the back. 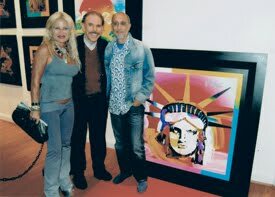 Purchase only PETER MAX mixed media and canvases with the Artist present and request for his signature on the back of the piece. There are multiple forgeries even originated (Provenance) at galleries that once could have been validated by the MAX studio.